These are the basics of Android applications. 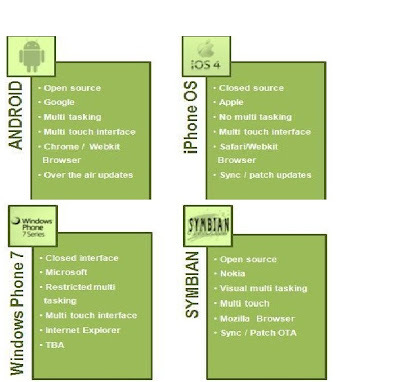 There are different other Mobile operating systems also present in market in competition with Android. Apple's iOS and Windows Phone give strong competition to Android. A simple comparison between features and specifications of latest version of Android and other Operating Systems can be seen in the table given below. According to Canalys, In Q2 2009 Android had 2.8% market share which had grown to 33% market share by Q4 2010 which made Android leader of smart phone OSs worldwide. The market share for commonly used mobile OSs is shown in the following pie chart. Browser: Android's new version includes a number of new features for simple, fast and convenient browsing with the Quick UI controls. It also supports popular web standards like CSS 3D, Animations and CSS fixed positioning to all sites, mobile or desktop. It also supports playback of HTML5 video content. To make it better and convenient to manage favorite content, users can now save a web page locally for offline viewing, including all styling and images. Gallery: Now the new gallery supports PTP (Picture Transfer Protocol) so that users can directly connect their cameras with Android device and transfer pictures with a single touch. Calendar: Calendar grids are larger, for better readability and more accurate touch-targeting. Additionally, users can create a larger viewing area for grids by hiding the calendar list controls. Controls in the date picker are redesigned, making them easier to see and use. Contacts: The Contacts app now lets you locate contacts more easily using full text search. Search returns matching results from all fields that are stored for a contact. Email: When replying or forwarding an HTML message, The Email app now sends both plain text and HTML bodies as a multi-part mime message. This ensures that the message will be formatted properly for all recipients. Folder prefixes for IMAP accounts are now easier to define and manage. To conserve battery power and minimize cell data usage, the application now prefetches email from the server only when the device is connected to a Wi-Fi access point. Enterprise support: Users can now configure an HTTP proxy for each connected Wi-Fi access point. This lets administrators work with users to set a proxy hostname, port, and any bypass sub domains. This proxy configuration is automatically used by the Browser when the Wi-Fi access point is connected, and may optionally be used by other apps. The proxy and IP configuration is now backed up and restored across system updates and resets. • Real Time Transport – protocol (RTP) ATI for control over audio streaming sessions. With all these new features Android 3.1 is making life more comfortable and advanced. Now with advanced browser, gallery, calendar, USB support, new hardwares supporting this OS are pretty convenient. Cell phones have really evolved earlier features like camera and music player but now latest hardwares not only support such features but advanced use of such features as well as Bar code scanner, text scanner etc which has made life better and simpler and Android has played an instrumental role in this evolution with thousands of applications available in Android market and open chance for developers to make it more advanced and better. In a way Android has changed its users' life completely.